On 4/2/2009 the Maryland senate approved SB277 (statewide speed camera authorization) by a 20-27 vote. This came after the senate failed to pass SB277 by a 23 to 24 vote on Wednesday 4/1. However Senator Curie called for a motion to reconsider, followed by an unusual "motion to limit debate" by Senator Kasemeyer. Governor O'Malley apparently intervened to persuade several senators to change their votes. The legislation must still be approved by the house, where it's passage is a near certainty. You can see how senators voted on April 2 here. We will update our legislative scorecard shortly so you can more easily see congressional districts and party affiliation. also changed their votes, but as sponsors of the legislation were apparently originally holding our for something even more sweeping that the version of the bill which passed. We will update our legislative scorecard shortly so you can more easily identify how YOUR delegates voted. "Sen. George W. Della Jr. (D-Baltimore) told fellow senators that he was recently ticketed by a camera in the District, where the devices are allowed. When he examined the citation, he realized that the license plate pictured in the photo belonged to a car he owned years ago. "It was a blatant error," he said. But Della said that when he called to complain, he was told that the only way to avoid paying the ticket would be to explain the problem at a court hearing." There are some limits to the use of the cameras in these bill. SB277 restricts them to "highway work zones" and streets within 1/2 mile of a school (which will include most residential streets). Last year an amendment to a similar bill which would have required highway work zones to have at least one worker present was rejected, so there is no such requirement on the highway work zone cameras. This year SB277 specifically states "regardless of whether workers are present". SB277 states that the "work zone speed control systems" will be authorized to ticket vehicles traveling on a highway "that is an expressway or a controlled access highway as defined in 21-101 of this title" and "on which the speed limit, established using accepted traffic engineering practices, is 45 miles per hour OR GREATER". 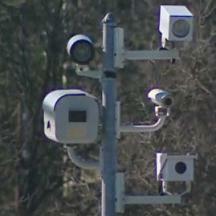 Yes people, 55mph is greater than 45, meaning that 55mph freeways in Maryland will have speed cameras! The ORIGINAL version of SB277 contained the following restriction, which was REMOVED by an amendment before it was passed. "If a speed monitoring system is placed within 250 feet after the location of a sign decreasing the maximum speed limit on a highway, the speed monitoring system shall be calibrated only to record images of motor vehicles traveling at speeds at least 12 miles per hour above the posted speed limit in effect before the location of the sign" The removal of that restriction will allow localities to reserve the right to create situations like this one. Another amendment which was proposed to SB277 this year, but which the senate rejected, would have required that "A work zone speed control system shall be capable of being moved from one location to another". OK, so this part of the legislation is for work zones only, but the work zones are on FREEWAYS, do NOT need to have workers, and are allowed to have PERMANENT cameras?!? 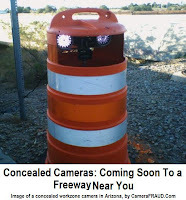 The county level bills would all allow the cameras on "highways in a residential district", which in Montgomery County has been interpreted to include 6-lane state highways like Connecticut and New Hampshire Avenues. Now is not the time for complacency or for surrender. Once the cameras get established across the state, it will be almost impossible to uproot them, as local jurisdictions become addicted to the ill gotten revenue. They will bend and break the rules to maximize that revenue, install more and more cameras ever year -- just as Montgomery County is doing right now. And every year they will return to the legislature trying to get restrictions on their use removed. In 2008, the legislation authorizing statewide cameras passed in both houses but was halted on the final day of the session. This legislation CAN STILL BE STOPPED! Keep the pressure up -- write or call your legislators RIGHT NOW!! !